What Day Of The Week Was November 29, 1990? 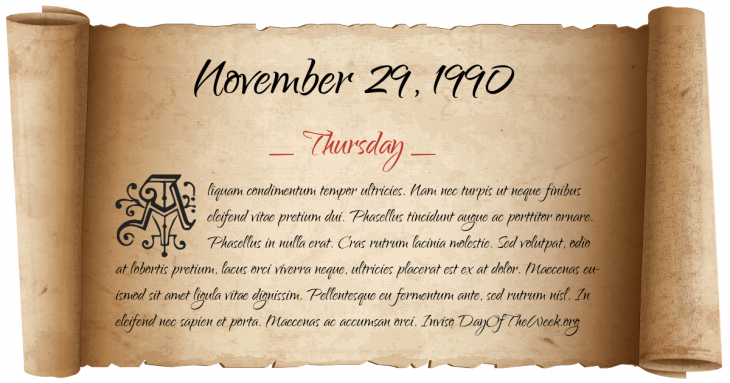 November 29, 1990 was the 333rd day of the year 1990 in the Gregorian calendar. There were 32 days remaining until the end of the year. The day of the week was Thursday. A person born on this day will be 28 years old today. If that same person saved a Cent every day starting at age 3, then by now that person has accumulated $92.74 today. Gulf War: The United Nations Security Council passes two resolutions to restore international peace and security if Iraq did not withdraw its forces from Kuwait and free all foreign hostages by January 15, 1991.